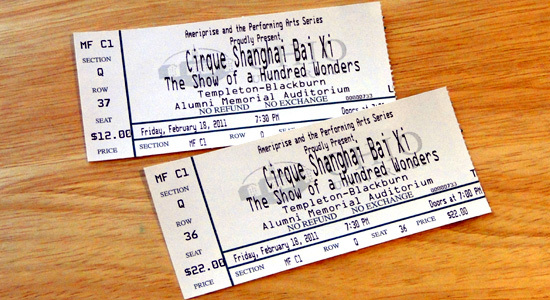 Tonight Sarah and I went to Ohio University's Templeton-Blackburn Alumni Memorial Auditorium to see Cirque Shanghai Bai Xi. Dating back to the Han Dynasty more than 2000 years ago, Chinese acrobatic spectacles were first called “Bai Xi,” meaning “one hundred amazing acts,” in reference to the performer’s seemingly limitless skills and innumerable feats they could perform. Awesome displays of physical strength with incredible feats of balance; graceful folkloric pageantry with fast paced contemporary dance; energetic martial arts with phenomenal equilibrialist skills… all performed in spectacular costumes and set design. We really enjoyed this international treat brought here to Athens.